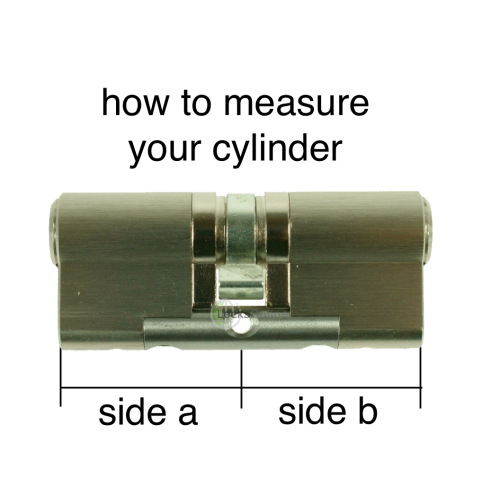 Not all cylinders are made equal and when it comes to the principle security of your home, having a cylinder that fights back against being picked or drilled is important. In addition to what is basic, these days the LocksOnline EPS cylinders can offer more. 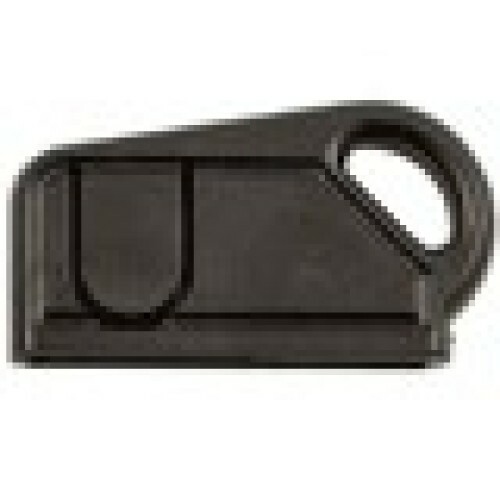 Like patent protection on the key, which protects you from others getting you key cut and we do more as a company. 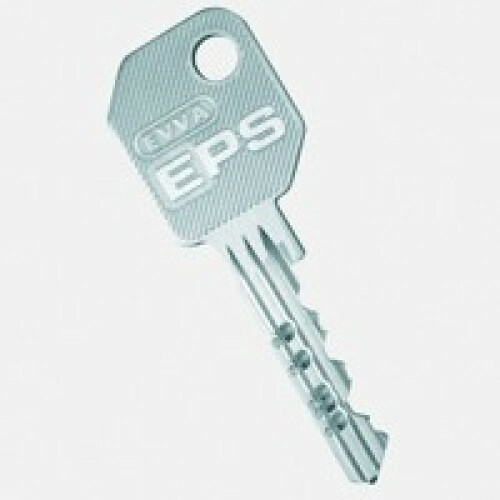 We record your cylinder so we can keep a record for you of how many keys is cut. 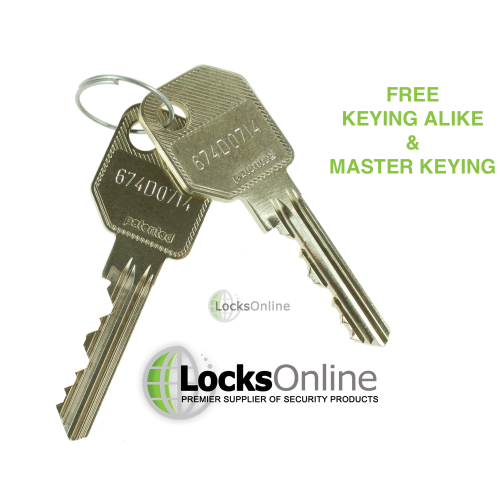 If your key is ordered, we check our database to see if it was the person who has requested the key bought the cylinder originally. If not, we will contact you to confirm. 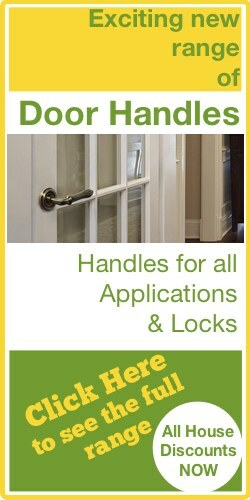 This service is free, and we offer it to our LocksOnline customers as a thank you for your custom. 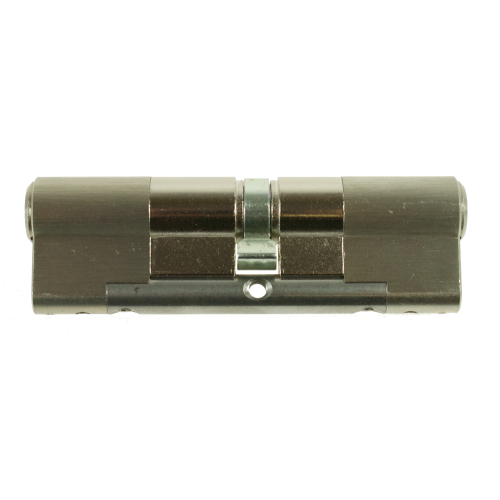 Don't forget the LocksOnline EPS cylinders is backed by being BS EN1303 graded, and in addition to this, *because of the way we build these cylinders (with a steel core connecting rod), these cylinders will stand up to lock-snapping a lot better than standard cylinders. Each cylinder is hand built for your needs, so when we are making cylinders. 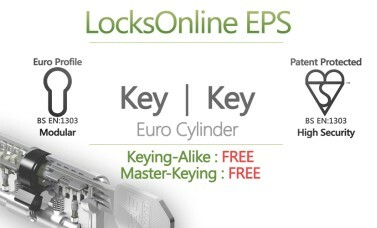 It makes no difference to us if they were keyed alike, master keyed or all to have unique keys, it takes the same amount of time to build these cylinders and record the data, so unlike many we don't charge any extra if you want them keyed alike or master keyed. 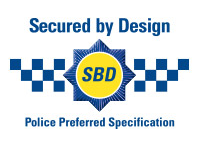 Every one of our EPS cylinders is also 90 minute fire rated! 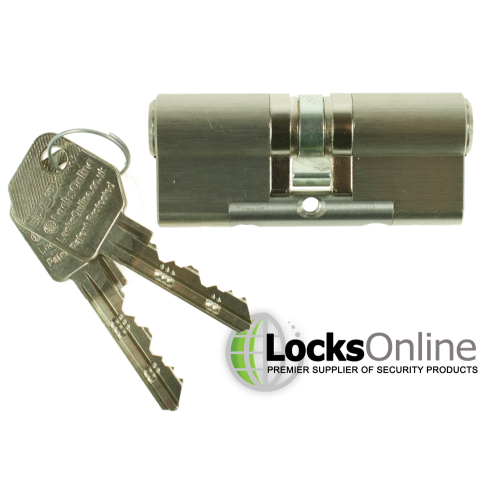 One of the main things that both we and our customers love about the LocksOnline EPS range is that these are custom built by us to your specifications. So if you have a door that needs an offset cylinder we can do it, and can also achieve much longer length cylinders than 'off-the-shelf' solutions. 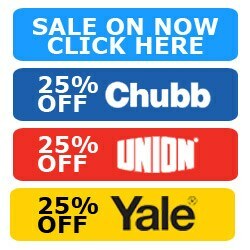 Bear in mind that because these are hand built to your specification we are unable to accept the return of these items for a refund so please be mindful of this when ordering. However we are human and realise mistakes can be made - so don't worry, we are able make alterations to pinning arrangements or incorrect sizing etc if required, this may incur a workshop fee but does allow for correction of incorrect specification at the time of ordering. We also supply two keys for each cylinder no matter how you have configured them. 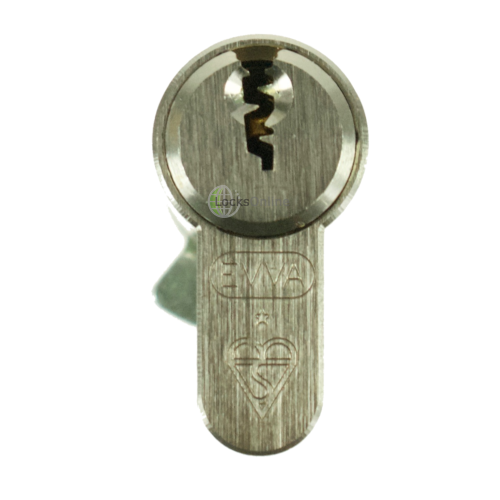 So if you buy five cylinders keyed alike you will get ten keys. These cylinders offer real value for money as we can strip these cylinders down and re-pin them if needed, we can cut your keys and send them recorded post quickly. If you want to add extra cylinders to a previous order, and you want those cylinders to be keyed alike with your last order or part of an ongoing master key system. Add the reference in the box when you order, and you can easily add to your existing cylinder suite, just via the key number. 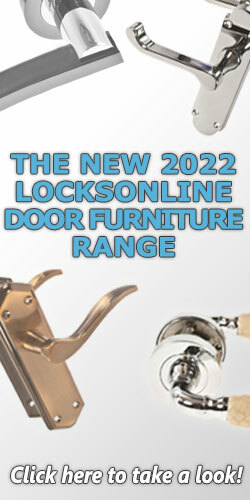 LocksOnline in conjunction with the Walters Group has been sporting the building of euro profile cylinders for over 25 years so you can rest assured we have stood the test of time and have tens of thousands of cylinders out there that have been built for our discerning clients both locally and throughout the UK and Europe. Every customer is a special customer so let us build a quality cylinder to protect your home just for you, let us create a master key system just for you and if your empire expands in the future so can we, by growing your master key system for you. 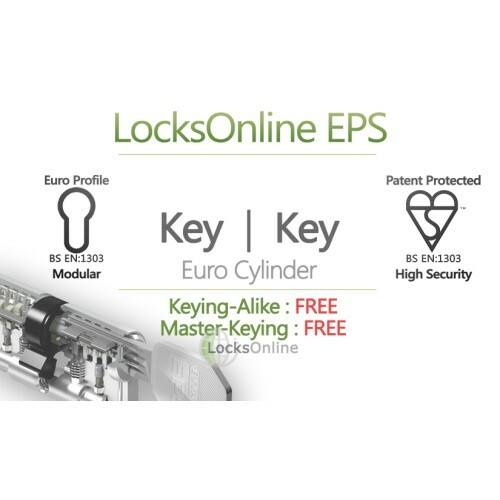 Don't forget, ALL cylinders in the LocksOnline EPS range can be keyed alike, or master keyed, that means, Euro Cylinders, Oval Cylinders, Rim Cylinders, and much more can be keyed alike, or master keyed. 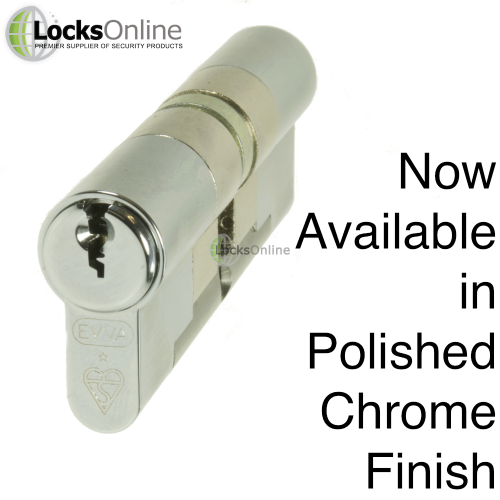 We even have a great range of standard security, marine grade and high-security padlocks that can accommodate the LocksOnline EPS cylinders so can also be included in your keyed-alike or master-keyed cylinder suite. You can see the size of cylinders we offer is huge, and we can even build bigger cylinders than this to special order. So even if you have an oddball of a cylinder, please get in-touch we are sure we will be able to accommodate you. To cap it off, we offer a lifetime warranty on our cylinders. There are conditions to this, but in essence, if a part prematurely mechanically fails we will repair or replace the cylinder for you. 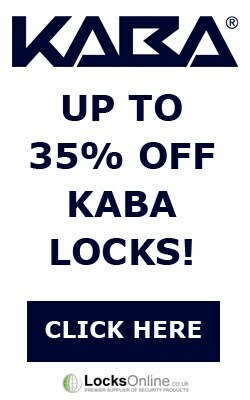 We're so confident these are fantastic security products, we're giving them a LIFETIME GUARANTEE, exclusively from Locksonline! Please note that these are hand-built to order so please allow for additional time time to be built (this affects all orders including those choosing express delivery).